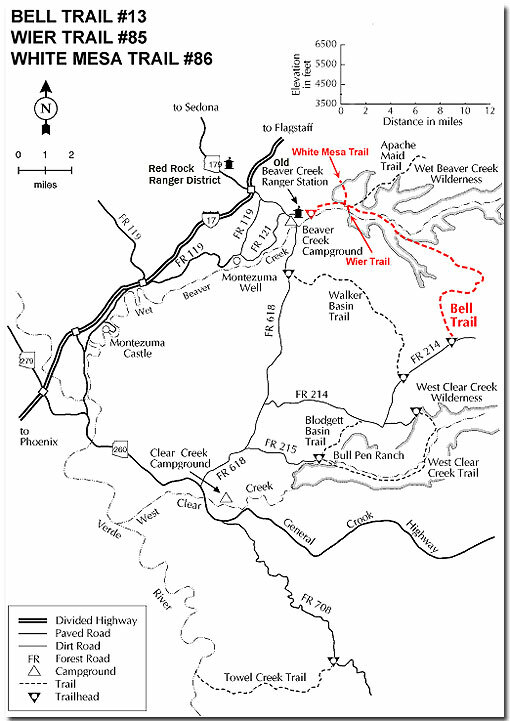 The Wier Trail provides easy access to Wet Beaver Creek as it contours from near the information board on the Bell Trail before dropping to creek level at the gaging station. The gaging station is used by the USGS to record stream-flow information. Please stay away from the gaging station and do not tamper with the equipment. The vegetation found near the junction of the Bell and Wier Trails is typical Upper Sonoran species: prickly pear, agave, catclaw and juniper. Once the trail reaches the creek the vegetation changes dramatically. The Upper Sonoran species are replaced by riparian vegetation consisting of Arizona black walnut, willow, ash, sycamore, cottonwood, canyon grape, blackberries, and poison ivy (learn to identify and avoid this three-leaved plant). The numerous deep pools in the creek contain introduced trout and bass, and the native round-tail chub. The trail continues upstream and enters the Wet Beaver Wilderness. The Wilderness is closed to the use of motorized equipment and mechanized transport, including bicycles. The trail follows the north side of the creek and ends at a large cobbled area where the creek comes in from the northeast.